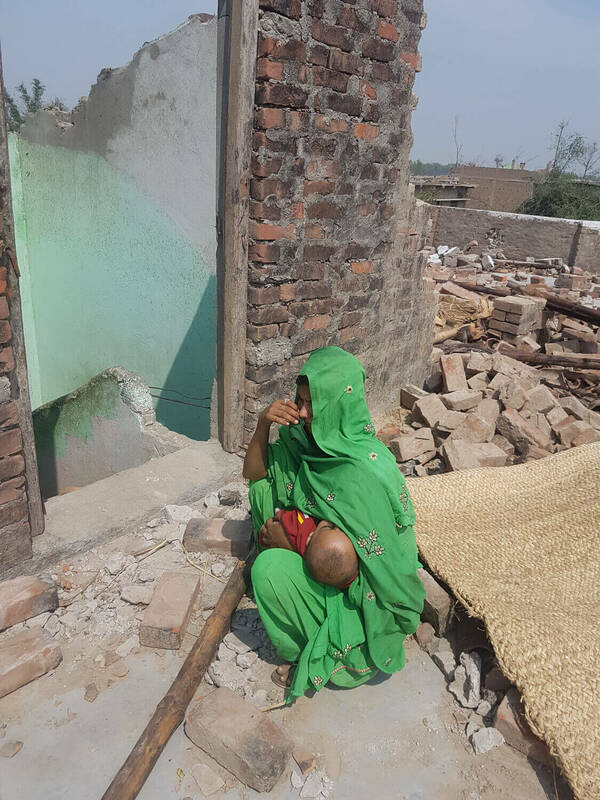 When the wind started picking up on Sunday night, Aizul Hat Miya Thakurai Faizullah’s wife Mustakima Khatun and daughter-in-law Bibiya Khatun rushed indoors thinking their new brick and cement house would protect them from the storm. It turned out to be a fatal mistake. The tornado tore through the village of Pheta like a scythe with wind speeds topping 400 km/h. The wall of Faizullah’s house caved in, burying his wife and daughter-in-law. Faizullah (above) only survived because he had left for Jitpur market to sell his employer’s water buffalo. In fact, while his wife was battling with death, Faizullah was munching on snacks she had packed for him earlier in the day as he waited out the storm in Harpur. A neighbour came searching for him, and when he finally reached home at 11:30 on Sunday night, it was only to see his wife and daughter-in-law with other bodies lined up at the damaged neighbourhood mosque. “She said goodbye in the morning, and when I came back at night she was dead,” said 62-year-old Faizullah, as he rubbed his swollen eyes. 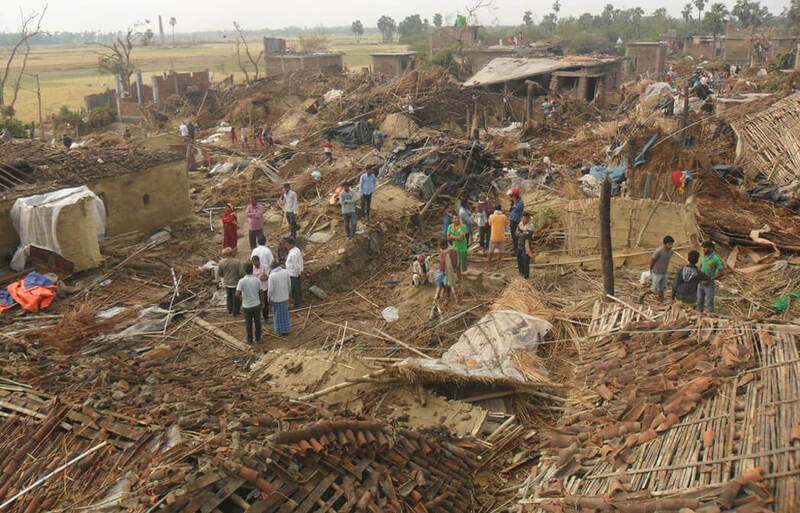 The tornado killed at least 30 people in Bara and Parsa districts, and most of those who died here were from Muslim families and were crushed by masonry, hit by falling pillars or flying debris. The fatalities show a clear link with Nepal’s migration-driven economy. Faizullah himself used to live in a mud and thatch hut till recently, but after working for three years in Saudi Arabia he built his brick house with the money saved. His only surviving son, Rais Aalam, is in Malaysia, and sends money home regularly. Faizullah’s eight other children died young due to various infections, and Aalam is his only support in old age. He used all of the Rs450,000 earned in Saudi Arabia to build the brick structure nine months ago. It is now gone, and he will have to earn a living selling buffaloes in the market. 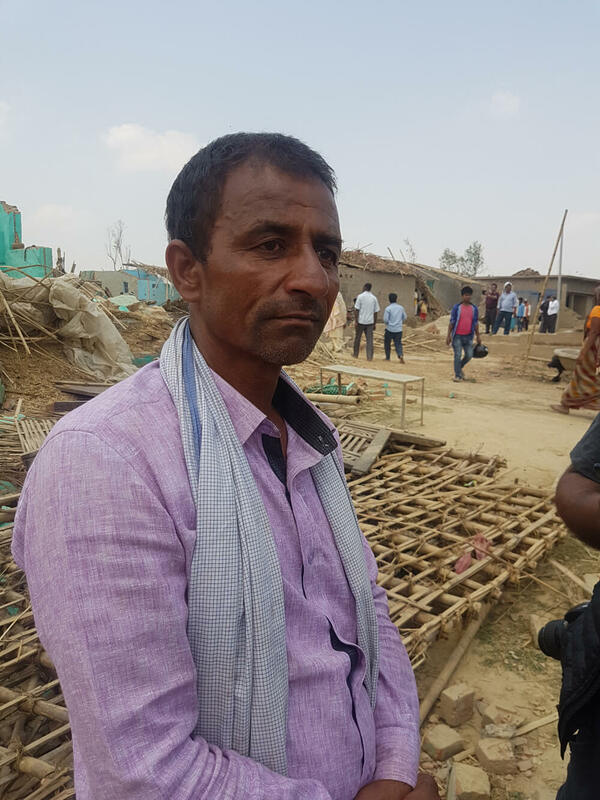 Faizullah’s neighbour Ezhar Miya also lost his wife, daughter-in-law and two young grand-daughters when his house collapsed, trapping the family. He had sold their original hut and moved to the brick house he built with the money his son, Bhuwar, sent home from Qatar. Many Nepali families are eating better, wear better clothes, and have built stronger homes with the money relatives working overseas send home. However, many of the houses are poorly engineered, use sub-standard raw material. This was the reason for the high fatality rate in Bara and Parsa this week. 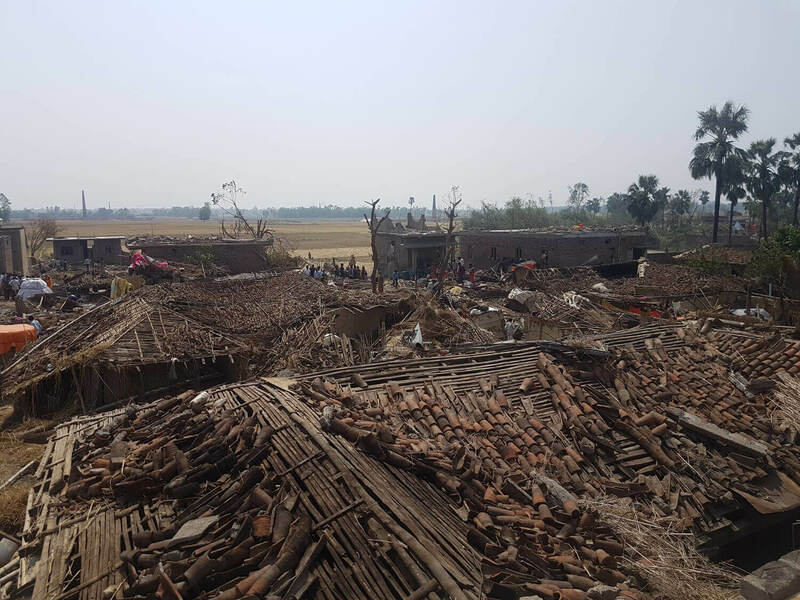 What appeared to be strong brick and cement houses crumbled like match-sticks within seconds as the tornado tore through the villages in a wreckage path 100m wide and up to 20km long. It is a tragic irony that many who had invested in stronger houses perished in Bara on Sunday night. But poorer neighbours living in mud and thatch huts nearby survived. 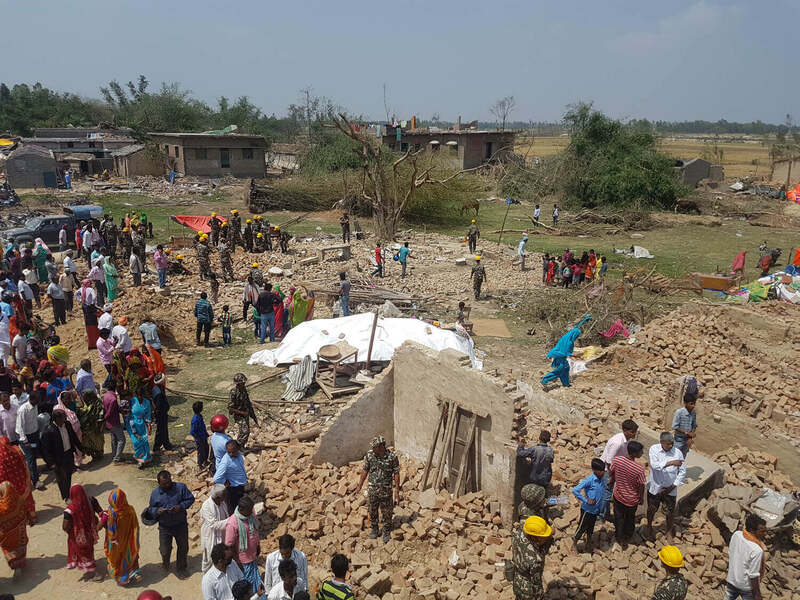 The government says 1,895 huts and buildings went down in the storm, 955 structures were partially damaged and 940 collapsed completely — homes, brick kilns, health posts and mosques. Of the 27 people killed, four were from India. It was the first major disaster to hit Nepal post-local elections in 2017, and the presence of elected Municpality and Ward officials was reflected in the immediate rescue operation. Rapid response teams under local disaster management committees quickly mobilised Police and Nepal Army personnel which helped in timely rescue. However, the lack of proper equipment, and medical services were apparent. The understaffed Kalaiya Hospital in Bara operated throughout the Sunday as more and more injured were rushed in. Most suffered from hypothermia and fractures. Of the 354 patients ,two spinally injured were referred to Kathmandu and eight patients with head injury went to Birganj. 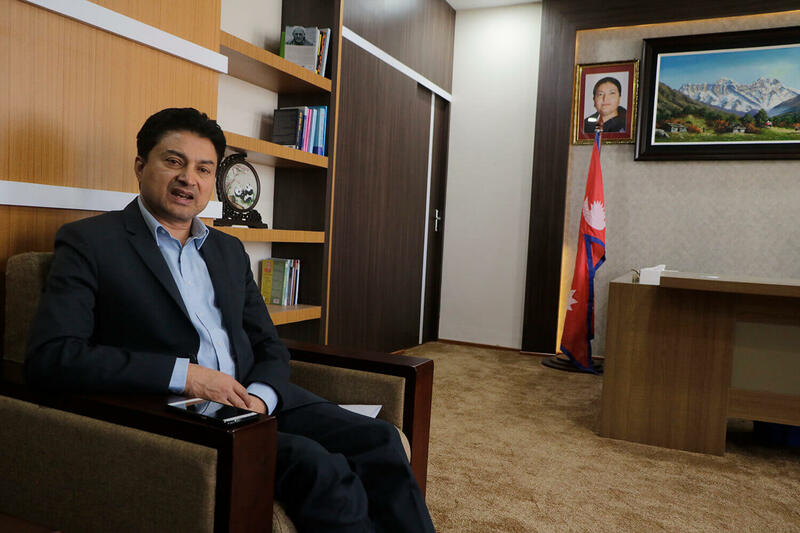 “We tried our best to provide immediate rescue and supplied electricity to the hospital despite a power cut,” said Bara CDO Rajesh Paudel. 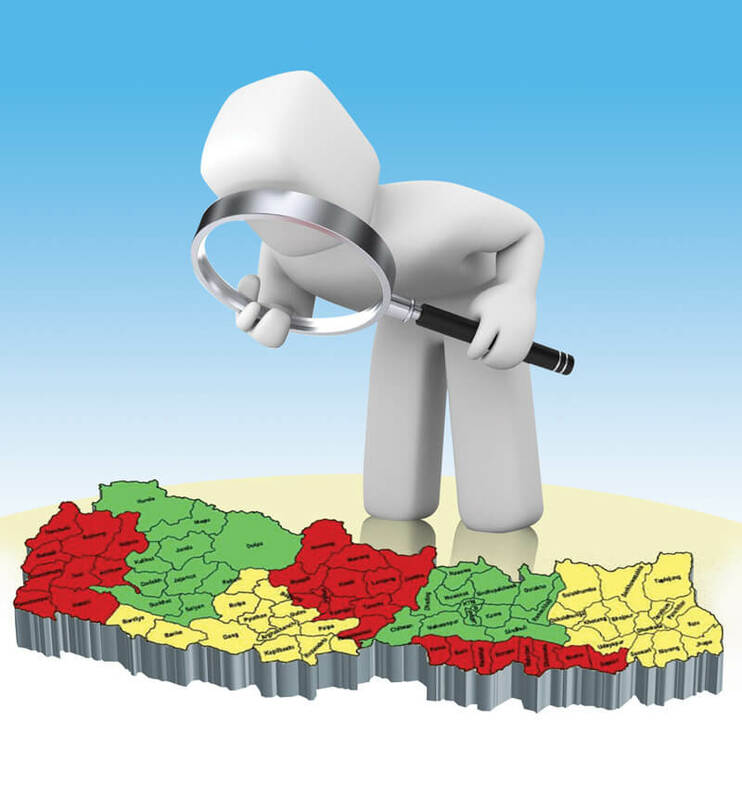 The lack of coordination between local, provincial and federal governments in information gathering had adverse effect on relief distribution. There were plenty of relief materials to go around but most essential items like tents, tarpaulins and medicines were in short supply. VIP visits did not help the situation and only added to gawkers from surrounding areas. The tornado was not the first of its kind in Nepal. 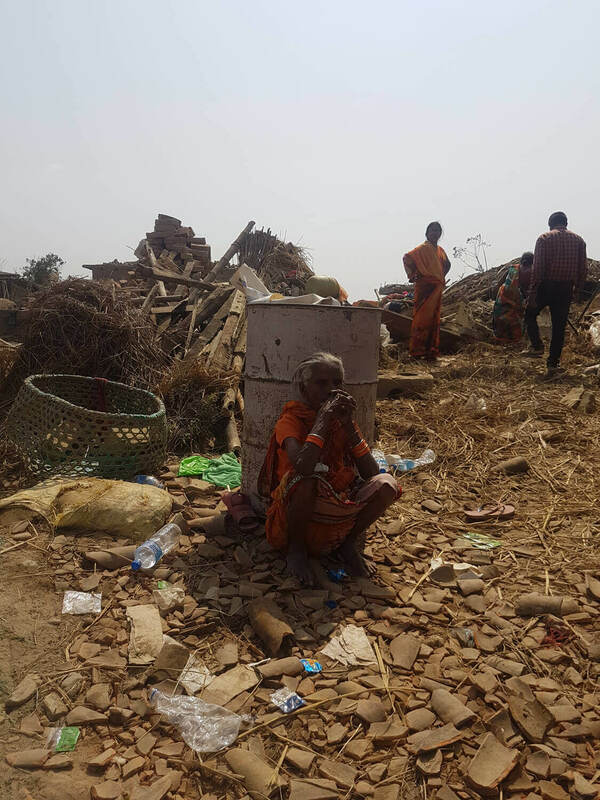 In fact, literature and folklore speak of twisters ravaging Tarai villages. But because these are localised disasters, they did not make it to the news. The Bara-Parsa disaster should be taken as an opportunity to invest on weather forecasting equipment and training for climate modelers. Nepal needs customised weather modeling for its conditions, experts say. We have learned some lessons from previous disasters and the presence of local government after 20 years helped search and rescue operations, but the Sunday’s tornado still reflects the dire need of disaster preparedness.